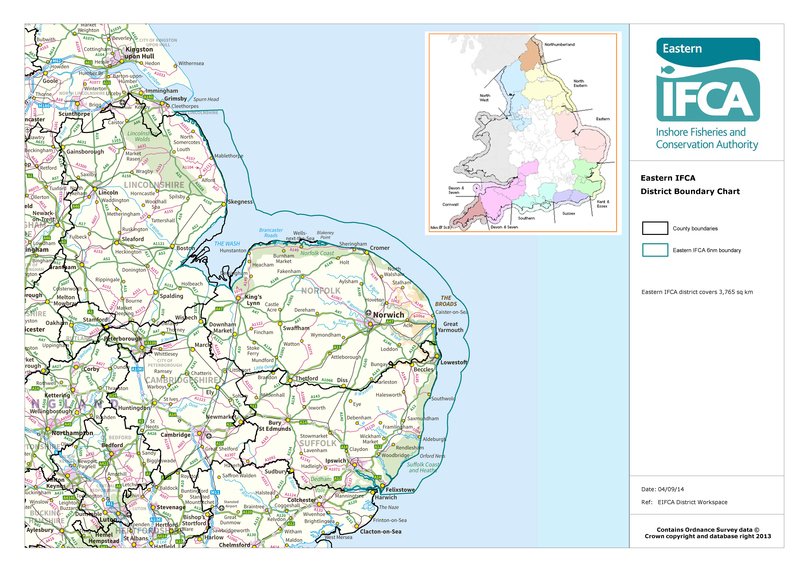 Eastern IFCA’s district encompasses the counties of Lincolnshire, Norfolk and Suffolk and extends 6 nautical miles out to sea (see the map to the left). The northern extent of the district starts at Haile Sand Fort in Lincolnshire and extends south to Harwich (half way across the River Stour). The legal definition of our district can be found in the Eastern Inshore Fisheries and Conservation Order 2010 (2010/2189). More detailed maps of our district can be downloaded by clicking the links below – please note, these are large files which may take some time to load. 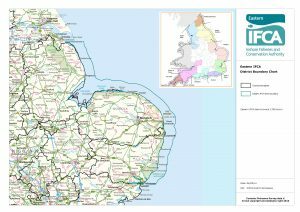 Further charts of the (old) Eastern Sea Fisheries District limits are currently archived, and should be used as the boundaries for the purposes of former ESFJC Byelaws which have been ported to EIFCA – if you wish to see these please contact us. Additionally, there is a shapefile available showing the EIFCA District, and including the 1983 3nm and 6nm baselines. To obtain this data, please contact us. ESFJC District charts showing the 3nm limit derived from 1983 baselines are available below. These charts are relevant if referring to 3nm within EIFCA District. Please note the Flamborough Head to Blakeney Point chart does not include that part of our district between Donna Nook and Haile Sand Fort. Please note these images are extremely high resolution, therefore depending on your computers’ graphic card it may be necessary to ‘zoom in’ to view detail clearly. Copies of these charts are available on disc from the office on request.